Policing cultures have reflected a conservative mindedness, particularly when directed toward street-involved, unhoused persons. Yet alongside an increase in urban poverty across Canada, public police today have taken up a puzzling, disturbing affinity with the identity of homelessness. We explore public police use of an undercover technique called “hobocops”. As part of these operations, public police disguise themselves as homeless people holding cardboard signs at busy motor traffic intersections as a way of regulating distracted driving. We explore these practices as encounters between the increasingly everyday activities of covert policing, urban governance, and a sociological account of police engaging in identity co-optation. 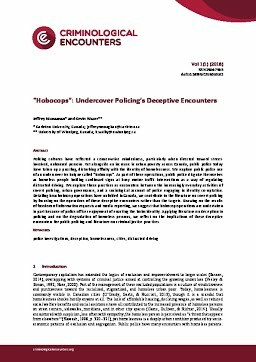 Detailing how hobocop operations have unfolded in Canada, we contribute to the literature on covert policing by focusing on the operatives of these deceptive encounters rather than the targets. Drawing on the results of freedom of information requests and media reporting, we suggest that hobocop operations are undertaken in part because of police officer enjoyment of enacting the hobo identity. Applying literature on deception in policing and on the degradation of homeless persons, we reflect on the implications of these deceptive encounters for public policing and literature on criminal justice practices.